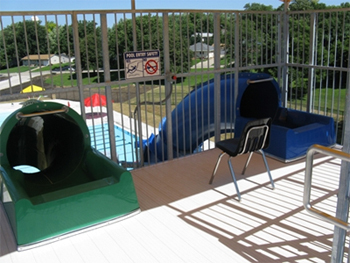 The Carroll Family Aquatic Center is one of the great ammenities in Carroll. People from Carroll and the surrounding communities come and enjoy all the Aquatic Center has to offer. The large 11,245 square feet area provides plenty of room to bring friends and family to enjoy some fun in the sun. A family is defined as all immediate family members residing at the same address. This includes children legally supported by mother; father or legal guardian (must show proof of guardianship if requested by Recreation Staff). Anyone else will need to purchase a single season pass or pay daily admission or get a Caregiver pass for an additional $25.00. Youth under 8 years of age are not allowed in the facility independently and must be actively supervised by someone at least 14 years of age. The supervising person must come to the pool and will pay admission or have a membership. Lifeguards enforce rules, regulations and respond to aquatic emergencies, but parents are ultimately responsible for the safety and supervision of their children. The conduct policy for patrons breaking Aquatic Center rules will be in effect. Severity can depend on which rule or rules are broken and the number of repeat offenses. So, please read and follow all posted rules, listen to lifeguards and Aquatic Center Staff! !